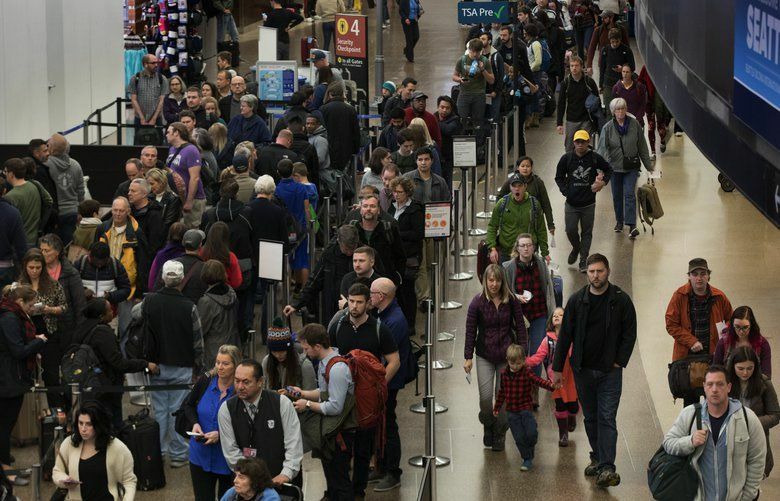 Travelers wait in lines at SeaTac International Airport before going through security Wednesday, November 21, 2018, the day before Thanksgiving. Airports are helping travelers cope with the frustrations of flying through yoga, art galleries and spas. Taken together, these could define the airport of the future — not to mention help travelers navigate increasingly stressful environments. The next time you feel stressed out at the airport, look up. If you’re lucky, you’ll see painted clouds, or a wall of vines and orchids, and you’ll hear the sounds of songbirds. If you do, it means you’re flying out of Terminal 2 at Oakland International Airport. That’s where Kaiser Permanente, together with the airport and the terminal’s tenant, Southwest Airlines, has devised an innovative way to de-stress at the airport. It’s just the latest way airports are helping travelers cope with the frustrations of flying. Other methods include yoga, art galleries and spas. Taken together, these could define the airport of the future — not to mention help travelers cope with an increasingly stressful activity. Late last year, Kaiser Permanente transformed a TSA checkpoint into a calming oasis. Highlights include a “living” green wall filled with plant species that clean indoor air naturally and provide a soothing ambient environment. Large white clouds suspended from the atrium ceiling greet airport patrons. Messages on panels throughout the checkpoint encourage them to “breathe in,” “relax” and “thrive.” At the end of the checkpoint, there are “H2O to go” stations where passengers can fill their reusable bottles with filtered water for free. The Kaiser Permanente destressing station was supposed to remain only until this month. But, after getting a positive reaction from guests, it’s been extended through the end of 2019. “All of these elements are designed to lower the frustration travelers often feel and represent a much larger effort to improve mental health and wellness,” says Mordecai. Many airports already have spas, massage facilities, coin-operated massage chairs and rest zones. At Chicago’s O’Hare International Airport, you’ll find a yoga room on the mezzanine level of the Terminal 3 Rotunda where you can “relax, reflect and recharge.” The 15-by-16-foot space features a sustainable bamboo-wood floor, floor-to-ceiling mirrors on one wall, and exercise mats, as well as an area to place personal articles and garments. Tampa International Airport has one of the most ambitious airport public-art programs in the United States, as well as a dedicated gallery. A visit to the airport museum offers you a space for quiet contemplation and exposure to local culture. In Tampa, that would be the works of Icelandic printmaker Elva Hreiðarsdóttir. Thanks to businesses like XpresSpa, which offers massages and facials in airports from Los Angeles to Miami, patrons can find a moment to relax before or after their flights. Not to be outdone, airport hotels are also offering spa treatments for stressed-out passengers (the Grand Hyatt DFW is one of the best known). As Kaiser Permanente’s Mordecai notes, not only is air travel stressful, but the stress level is increasing. From TSA screenings to smaller economy-class seats, there’s no shortage of things to freak you out at the airport and in the air. By the time travelers arrive at the security checkpoint, they’re already in full stress mode, he says. Worse, you’re surrounded by people who are also stressed out, and probably irritable as well. All of that adds up and can lead to unhappy airport guests and a diminished travel experience. Although Kaiser Permanente hasn’t done any scientific studies on the benefits of its destressing initiative, Mordecai told me the results are evident. These destressing initiatives may be the future of air travel. If airports — and indeed, airlines — worked on ways to lessen the stress of air travel, imagine the possibilities. Would the David Dao incident have happened? What about any of the recent dust-ups at the airport or on the plane, many of which, no doubt, were triggered by stress? It’s hard to know the answer. But this we know: Clouds above the TSA checkpoint are better than no clouds. Yoga rooms and art galleries are better than empty rooms with a view of a ramp. If these destressing options aren’t part of the airport of the future, you may want to consider driving. What de-stressing options are available at Sea-Tac? Seattle-Tacoma International Airport has a nondenominational Meditation/Quiet Room available to travelers and employees 24/7. The room is located before security on the airport’s mezzanine level above Checkpoint 3. Families traveling with infants and small children may also use lactation suites and a children’s play area beyond security. And if you need a breather after your flight, the Gina Marie Lindsay Hall on the baggage-claim level has rocking chairs. More information on amenities at Sea-Tac is available at www.portseattle.org/sea-tac/things-to-do. Seattle Times staff reporter Megan Burbank contributed to this story.